If you are missing some or all of your teeth, dentures make a great tooth replacement option for many patients. Dentures are removable and provide you with a beautiful smile even when you no longer have your natural teeth. 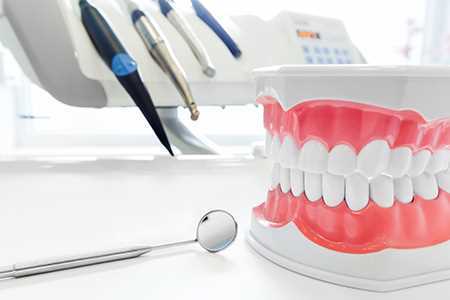 It is important that you have a dental examination performed prior to receiving dentures to ensure that they are the right option for you and that you do not need to have any other teeth removed. It is not uncommon for other teeth that suffer from tooth decay to need to be removed or treated prior to the placement of dentures. If you are interested in receiving dentures to replace any of your missing teeth, please call Access Dental Care to schedule an appointment. There are three main types of dentures available for you to choose from and the type that is right for your mouth will depend on your consultation and the recommendations of your dentist. The first type of dentures is called conventional full dentures. These dentures are placed in your mouth when all of your teeth are missing or need to be removed. If you need to have teeth pulled, you must wait until your mouth is fully healed before you receive these dentures, which can take up to six months. 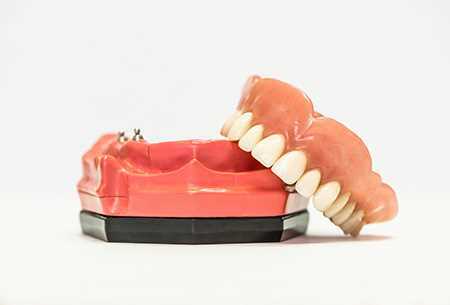 Once the gums are healed, full or complete dentures will be fitted for your mouth and you will receive a top and bottom plate. You can easily remove the dentures when needed including to clean them and before bed. The second option is partial dentures. This is a great option for those patients who are only missing a few teeth in their mouth. Partial dentures are almost identical to bridges, except they are removable and are not cemented in place. The last main type of dentures is immediate dentures. You can choose immediate dentures for both partial and full denture needs. The difference with immediate dentures is that they are placed in your mouth as soon as your teeth are removed. Since the gums will not be fully healed yet, you will need to have the dentures re-fitted and replaced over time to ensure they continue to fit properly in your mouth. Immediate dentures are ideal for patients who cannot wait for their gums to heal such as those who hold position where they need to speak and interact with the public. If you take care of your dentures, they will last a lifetime. You should brush and floss your dentures as you would with your natural teeth. It is important to allow the dentures to soak overnight in a solution as well. If you do not properly care for your dentures, they will become stained and they will warp over time, which means they will not properly fit in your mouth and may cause irritation to your gums. If you are interested in dentures or other tooth replacement options, call Access Dental Care today to schedule your appointment.